Pastured Poultry is a sustainable agriculture technique that calls for the raising of laying hens, meat chickens (broilers), or turkeys on pasture. Humane treatment, superior texture and flavor, and the health benefits of pastured poultry are causing an increase in demand for such products. 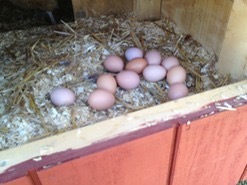 Pastured hens are happy hens! 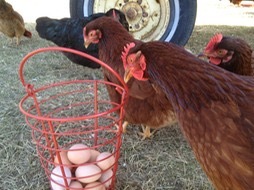 That is why our Rhode Island Reds and Barred Rocks are grown the old-fashioned way - out in a field at their natural rate. Our girls are free to roam on green pastures to hunt and peck for bugs and earthworms, while enjoying the freedom of their natural habitat. Because chickens cannot thrive on pasture and bugs alone, we provide them with a natural, soy/corn-free, grain-based layer feed. Here at Cabin Creek Heritage Farm we care about our chickens! We treat each of our ladies with respect and provide them with a good, healthy diet and lifestyle - giving us a much happier chicken and healthier, better-tasting eggs! our girls are treated to a feast of fresh grass, bugs, and worms - giving their eggs more flavor and that rich, deep colored yolk!